The ultimate 4WD all terrain tyre, designed and tested to withstand Australia’s harshest outback conditions. 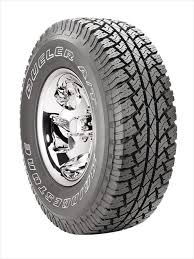 With heavy steel belt cords at their core, Dueler tyres deliver exceptional strength and elasticity. There’s more uniform tread contact with the road and reduced risk of sharp objects penetrating the tyre.